Last week I accompanied a friend to pick up some auction winnings and fell in love with a little couch there. I know I focus on Mid Century Modern, but I shop with an estate company that pulls from NYC metro and they offer many high end furnishings and décor that are not in my normal sourcing realm. This said, if you are looking for anything more traditional or ornate, please know I may be able to help you out with this. 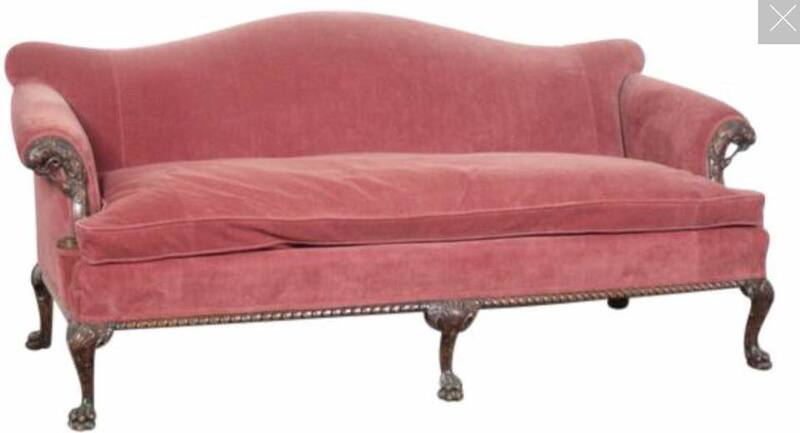 So back to the couch of dreams....what stole the show is that it's blush velvet upholstery was in relatively decent shape, only in need of a cleaning. The cushion has a down insert in it! So posh! 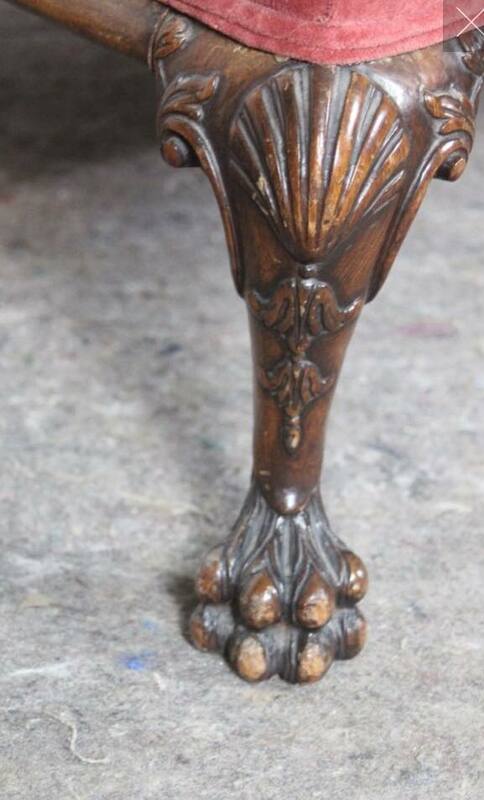 The style is classic Chippendale but features a very elaborately carved eagle with his talon in his mouth at each arm and of course, the paw feet. I have found no other couches like this online and it is most definitely the best of it's kind. They told me it was from the 1920's but I will be picking it up tomorrow so cannot wait to see if there are any more clues. If you follow my facebook, you may have seen when I posted the picture last Friday with a 'does anyone love this as much as me???' post? Well, in fact someone does and reached out. At this point, she is first in line to claim this beauty. In case she turns it down, it will get listed in my markets. I will be picking it up tomorrow along with some auction winnings I picked up. If you want me to have a look at anything while I am on the road, shoot me a message! I would be more than happy to shoot you pics of items that are for sale and keep an eye open at auction. The preview for the next week's auction is usually available which is always good to get a look at. The smalls I am bringing home will probably get listed over the weekend. Amazing 1920s Camelback Chippendale style couch. Beautifully carved arms and legs featuring eagles. This color is so hot right now in decorating trends. Paired with navy or neutrals, it is sure to look fabulous in an eclectic or traditional space! I am hoping to reveal more clues as to the dating of this piece when I get it home. This is new territory for me so I have a lot to learn and look forward to delving into another era and style! The eagle is so dreamy! Rolled arms are a common element to a Chippendale style couch. The elaborate carvings in the arms do not seem to be common, according to my searches! Most later reproductions (the original English Chippendales date to the 1700s) seem to lack the arm carved details to this extent. This foot is known as a lion's paw foot. Another popular foot style on Chippendale furniture is the Ball and Claw, which is literally an eagle claw holding a ball. A note on the shell referring to early 1900s Chippendale reproductions: Shell motifs carrying over from the Queen Anne period may be present, but are not as prevalent in this style as they were earlier in the 1700s. So couches may be the thing for me! The orange couch just sold. So I will be couchless if the pink beauty gets claimed right away. One thing I do still have is the beautifully restored day bed. I would love to find this thing a home. It is amazing. I do realize it is more of a specialty piece which makes it a little harder to place. My home would not be able to accommodate it until I kick a kid out. :) If you have any interest in it let me know. All brand new cushions with just the right detailing. Super neutral navy fabric from Joybird's pet and kid friendly line. Make great seating and can accommodate overnight guests. I would love to see it go to new parents as it would be a great addition to a nursery where you can catch some Zs and lounge comfortably with a baby. Wish I had something as nice when my kids were babies.....I slept on the floor more than once! ;) Of course, great for a den, spare room and more. All the details have been taken care of! Delivery in my region no extra charge. Get an instant shipping quote on my chairish.com listing. For my birthday, I found a great little Eames fiberglass side chair featuring an H base. It was painted so I spent a lot of time stripping it down. It is so cute and dated 1959. I believe it to be an early Zenith production and the black finish on the base is original. Super cute and worth the work to add it to my collection! Here is a look at the project. Stripping it took some physical work, but the product did not ruin the original shine at all! I even got the labels free of paint! I worked quickly in sections and was careful not to let the stripper sit too long as there were disclaimers on the product not to use on fiberglass. It had no ill effect! There were 4 layers of paint on this chair! It took some elbow grease and was not the most pleasant job. I have a full day into it. NEW ENGLAND SHOPPERS! I have a delivery scheduled in April to Rye, NH. I will be staying in Nashua for 2 days and then making a stop in Rhode Island on the way back. If you are looking at something larger and I can fit it in the car with the set I am delivering, I would gladly bring along for you to pick up or I can meet you. I am tag teaming the trip with a friend. Please reach out! I can hold your item with a deposit until the delivery. This is a rare opportunity to save some shipping! JUST LISTED: beautiful 21" diameter faceted mirror. Great for a hall, foyer or smaller wall. Mirrored glass is mounted on a heavy wood piece and features black painted wood with gold painting trim. Picking these auction winnings up Friday as well! Not sure which items I will be keeping but will be evaluating this weekend and getting them listed. I love having access to some very eclectic pieces and I welcome you to request weird stuff! The fun of shopping out of my area is finding higher end pieces! Reach out if you see something you love as I will let you have first shot!